I love these. My boys love these. It’s funny that we enjoy these as much as we do, because two of us don’t tolerate heat very well. 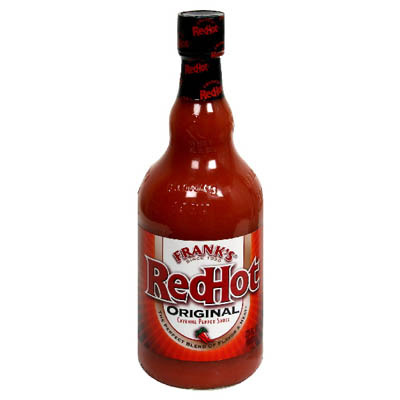 We have a solution for that though… ranch or blue cheese dressing for dipping, and a tall glass of milk to wash it down. What I don’t love about classic chicken wings are the skin, fat, bones, frying, and sauces full of artificial ingredients. I’m so glad I tried these. 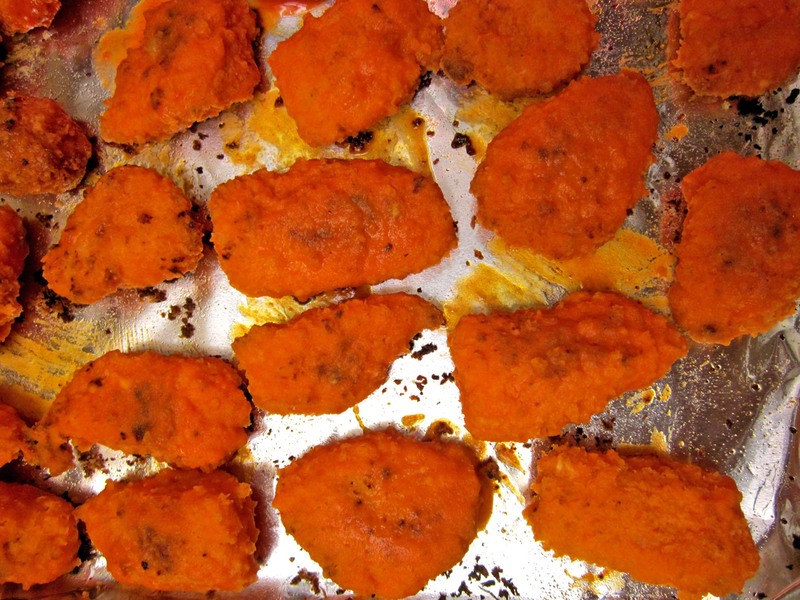 For this recipe, I simply combined a classic and easy method for oven baked chicken breast pieces, and coated them in a quick mix of cayenne pepper sauce and melted butter (margarine may work just as well). I feel so much better eating these, and feeding them to my family. These can be made gluten free as well. 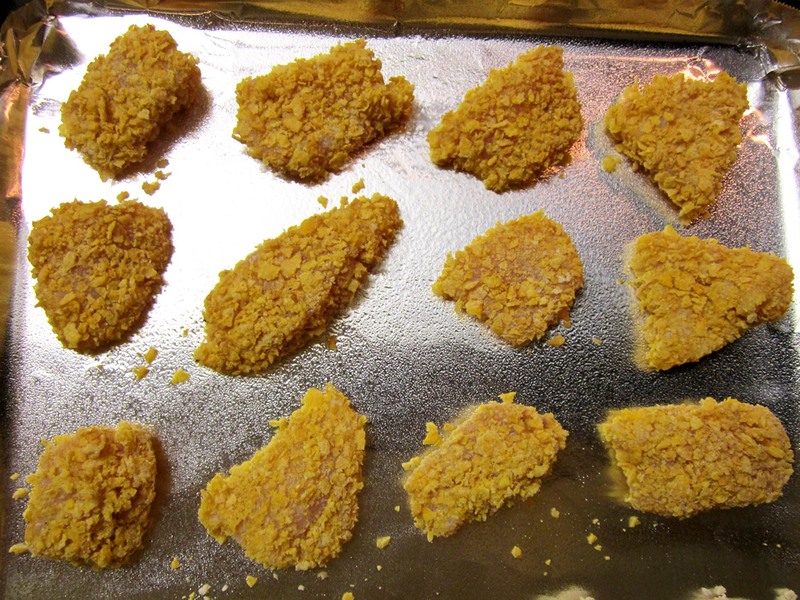 I tried both a corn flake coating and a panko bread crumb version, and they were equally delicious, you could hardly tell the difference between the two. 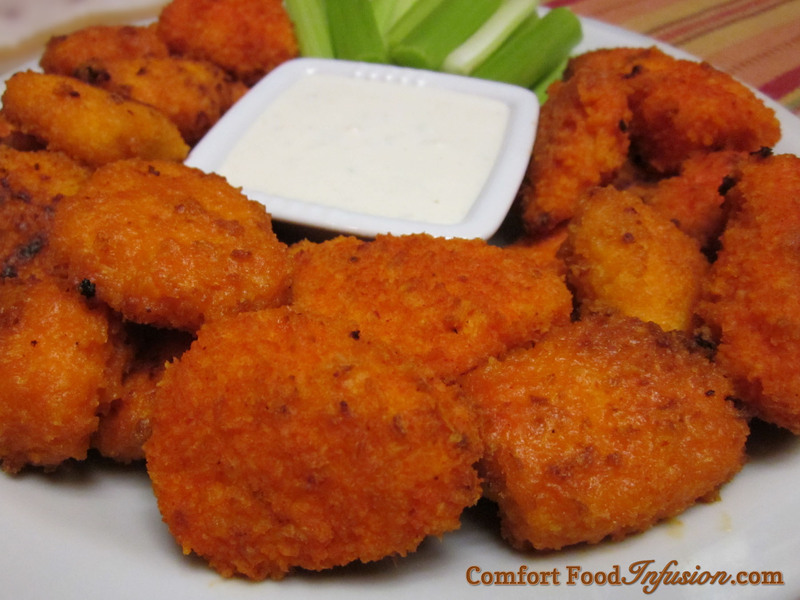 I make a large batch of these and freeze some, because the boys ask for them all the time. 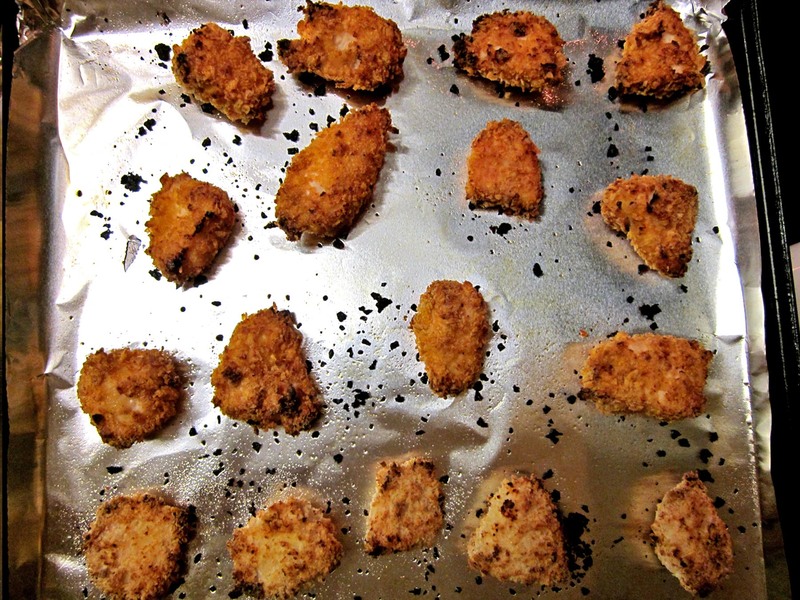 Arrange chicken pieces (that have been dredged in buttermilk, and panko/corn flake coating) on a cookie sheet lined with tin foil and sprayed with non-stick spray. Remove from oven and turn oven down to 400°. Place back on cookie sheet. 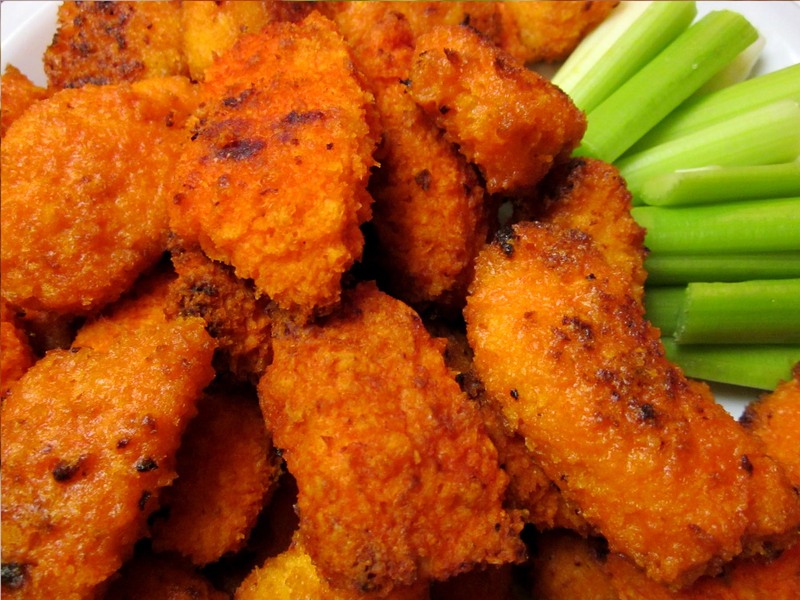 A healthy version of Buffalo wings. Baked breast pieces dipped in a classic cayenne pepper sauce. Gluten free options. Place chicken pieces into a large bowl. Pour buttermilk over chicken to coat. Let sit while you continue. In a large shallow bowl, or pie tin, combine panko (or crushed corn flakes), flour (rice or wheat), seasoned salt, and pepper. Mix to combine. Set oven to 475° F.
One at a time, remove a chicken piece from the buttermilk, let drain a second, then place in bread crumb mixture. Coat both sides, press gently to adhere, and give a gentle shake so excess crumbs fall off. Place coated chicken pieces on a cookie sheet lined with foil or parchment, and sprayed with non-stick spray. Don't overcrowd. Spray pieces with a quick spritz of non-stick spray. Bake in a 475° oven for 12 minutes. Remove, flip each piece over, spray once again with non-stick spray, and return to oven for 12 more minutes. Turn oven down to 400°. 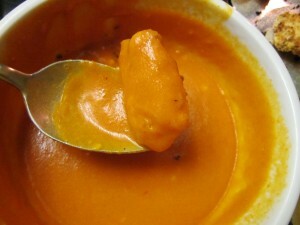 In a medium bowl, combine melted butter and cayenne pepper sauce. One at a time, using a spoon, tongs, or your fingers, dip each chicken piece into the sauce. Let the excess sauce drip of, and place on cookie sheet. Place back into 400° oven for about 8 minutes or until heated through. To make this gluten free, use about 3 cups corn flakes cereal (check for gluten free on label). Pour cereal into a large zip-lock bag, and with a rolling pin or heavy pan crush until you get a coarse flour/crumb mixture. This should yield approximately 2 cups after crushing.